Boundless stupidity? The future will show it. As you have already heard, the Germany Parliament have agreed on a rigid border regime. Refugees who are already registered in one country but are in another EU state will be sent back to the country of initial registration. So far so good. In the health sector, more than 50,000 people of the nursing staff are absent in Germany. The Ministry of Health will get them from Romania and Bulgaria, not fully accredited EU-member states. Probably these people are hired as a kind of guest worker without any benefit but also without obligation to the German social systems. These people will therefore have to return to their home countries after some time, after the care companies had made profit with them. This does neither serve these people nor the German social systems. Because the german citizens are so afraid of strangers, one does not want to be able to accept refugees permanently for these purposes? 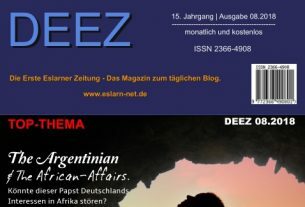 DEEZ – aktuell: Die neue Ausgabe ist da! 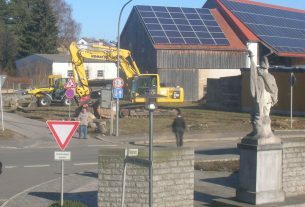 Eslarn – Tillyplatz: Tschechien die Schuld vor Augen führen!? 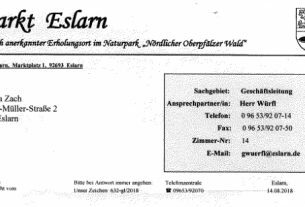 Eslarn – Städtebau: Guckst du! ?